The Kat Von D Tattoo Liner in "Trooper" is THE ultimate black eyeliner!!! It is my latest holy grail, and I am never looking back. It is applies blacker than black, and with serious precision. I have shaky hands, so I prefer eyeliner pens with felt tips. I have tried almost all the drugstore eyeliner pens -- NYX's Super Fat Eye Marker is nice at first, but doesn't deliver opaque black ink, and the pen itself dries up quickly. 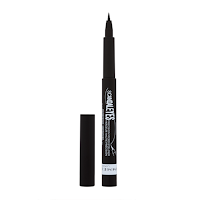 Rimmel's ScandalEyes Micro Eye Liner comes super close as a drugstore dupe because it has a thin and precise felt tip, but it falls short in delivering an opaque and fluid on the first run. I have to go over my line a few times to get a suitable opaque line -- not a big deal by any means, but the KVD conquers a dark opaque line in one stroke. I must admit, though, that ScandalEyes is a great beginner's eyeliner not only because it is waterproof and so affordable, but the tip is a little more stiff and allows for more control. I think my ScandalEyes trained me properly, and now I can use my Tattoo Liner with ease and skill. So, if you want to practice a bit before splurging on KVD, which retails for $19, definitely pick up ScandalEyes Micro Eye LIner for $5.99. 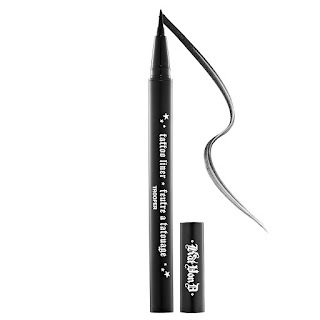 I am so in love with KVD's Tattoo Liner's extremely pointy, yet flexible felt tip. It delivers a dark black ink in a steady fluid line. 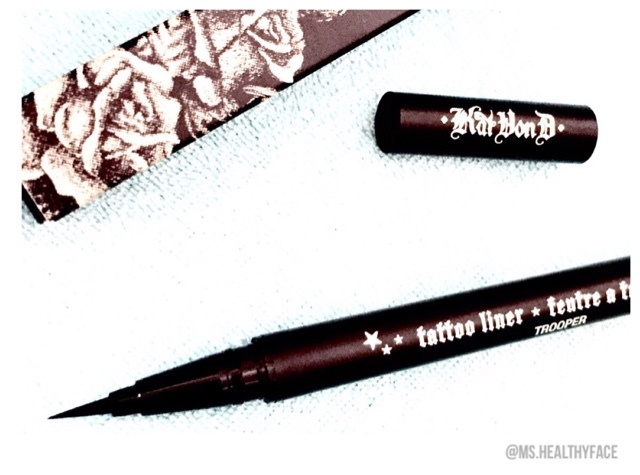 With a flick of the wrist, I got my cateye on, and once it's on, it's not moving, hence, the name -- TATTOO liner! With other eyeliners, I can usually do a quick wipe with my finger to remove any unwanted flicks, but with my Tattoo Liner I can't clean up without a brush dipped in micellar water or concealer. This is great news for me though because now I don't need to worry when I accidentally blink or sneeze mid-application. You NEED this eyeliner in your life. Also, come in brown, if you want a more natural look!